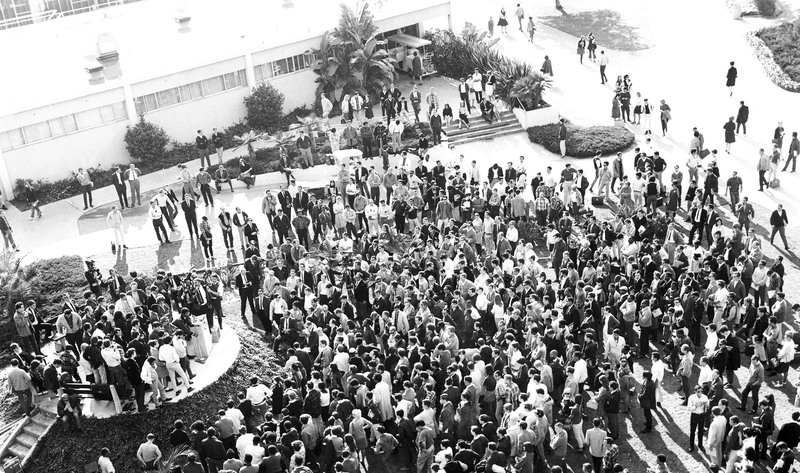 Students at Cal State LA in the 1960s and 1970s actively pressed for social causes, including rights for African-Americans, Mexican-Americans, Asian-Americans, Native Americans, women and farmworkers. Two student groups, United Mexican-American Students (UMAS) and the Black Student Union (BSU), took up the issue of underrepresentation of minorities in higher education and were a key force behind the creation of the Educational Opportunity Program. BSU and UMAS discover a regulation allowing two percent of students who did not meet Cal State admissions criteria to be granted admission as special admits. The exclusion had been used mainly for athletes. The student groups seek to change that. UMAS and BSU challenge the administration and convince them to reserve 50 special admit slots for underserved students. Associated Students Inc., votes to give BSU and UMAS $40,000 for a program for minority students. UMAS and BSU create a hierarchical structure for a pilot program. Administrators do not grant all of the 50 special admit slots for a minority student program. While clashing with the administration over special admit applications, 10 BSU students break into the Admissions and Records Office at Cal State LA to pull and scatter student files. Pilot program begins with 50 new incoming students. It is the precursor to EOP. Vice President of Academic Affairs Dr. Kenneth Martyn organizes a program to inform the Academic Senate about EOP at Cal State LA and says the University will commit to increasing opportunities for underserved students. Students and community members march to campus and students camp out for six days in tents in support of more EOP funding. State legislature passes Harmer Bill, establishing EOP as a state-funded organization. A mandatory one-week EOP Orientation takes place for the first time. This becomes the basic model for the Summer Bridge Program 15 years later. An introduction to higher education class is first offered and required for every EOP student. Learning Communities and Supplemental Instruction groups are developed to provide additional support to EOP students. The Tutorial Center at Cal State LA, originally developed by EOP, becomes the University Tutorial Center. * Information for this timeline was gathered from Educating the Excluded: What Led to the Mandate for Educational Opportunity at California State University, by Margaret Hart; and Historical Timeline: Roots of the Educational Opportunity Program at California State University, Los Angeles, by Maribel Nuñez.